The XT-HDMI-MX42-4K18G 4K HDMI matrix distributes four HDMI sources to two displays, transmitting all HDMI resolutions up to 4K 60Hz 4:4:4. 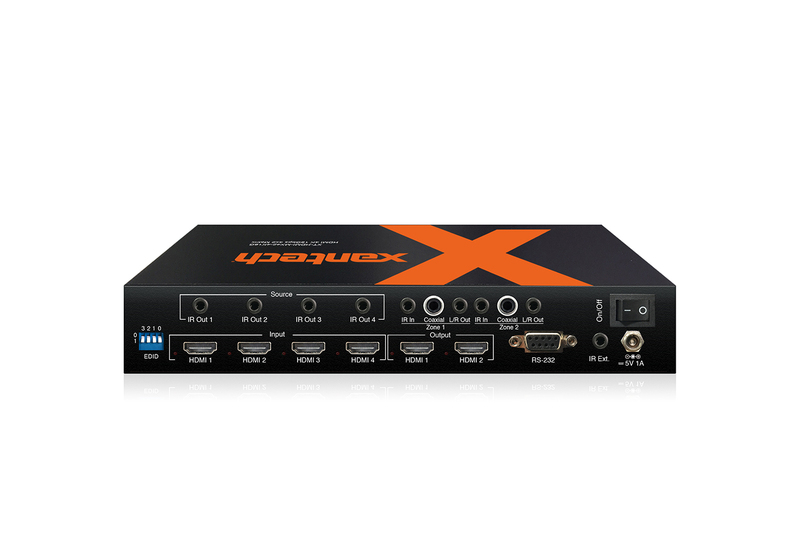 The XT-HDMI-MX42-4K18G 4K HDMI matrix features HDMI 2.0 chipsets with HDCP 2.2 support, allowing distribution of four HDMI sources to two displays. The unit transmits all HDMI resolutions up to and including 4K 60Hz 4:4:4. 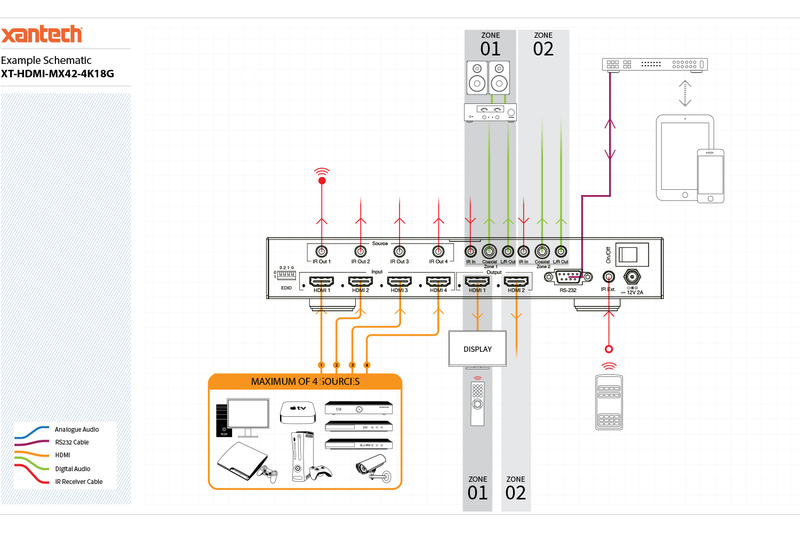 The 4-Way matrix also includes advanced features such as RS-232 for control and configuration of the matrix, bi-directional IR routing, audio breakout and EDID management. Important Note: This product uses Xantech’s legendary 12v IR signal to ensure reliability. 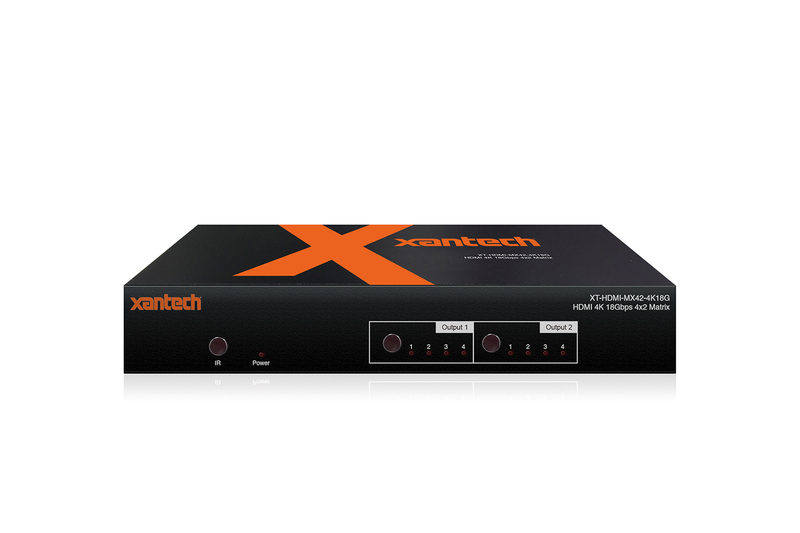 We recommend using any of Xantech’s IR receivers and emitters. This product is also compatible with all ELAN controller IR outputs. HDCP2.2 is the next generation of copy protection required to allow the playback of the latest 4K source media. A 4K display has four times the number of pixels than your current Full HD 1080p display so the clarity of the image is much more superior and detailed. For HDMI and Toslink cable accessories Click here. * Does not down-mix Dolby / DTS / multi-channel audio signal.